Visit the web page for more details. Click here for downloading the brochure. The link to the ranking portal is available here. Visit www.convocation.iimtrichy.ac.in to watch the video. Click here to download the photographs. Visit the web page for more details. Click here to download the FDP Brochure. IIM Tiruchirappali is ranked 9th among top B-Schools in MBAUniverse.com Rankings 2018-19. Dr. Padmanabhan Prasad visited IIM Trichy and interacted with FPR students and the Chairperson. 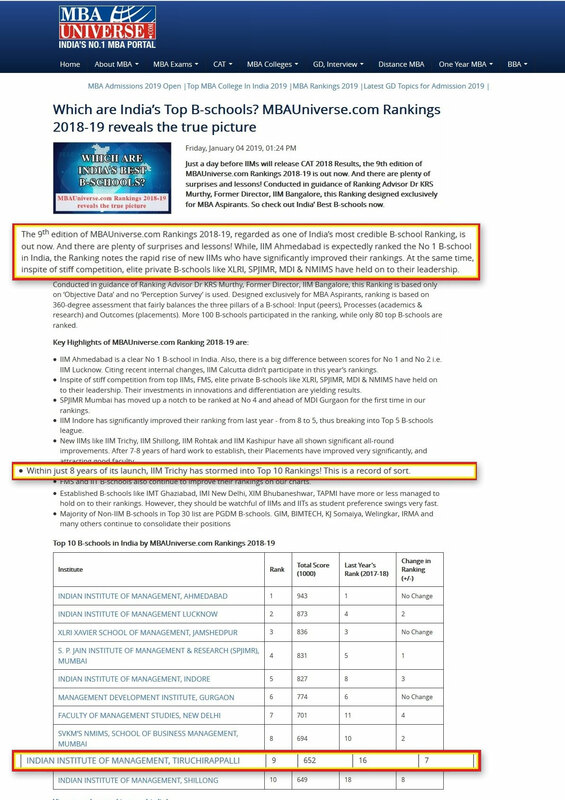 IIMT wins CFA Equity Research Challenge National Finals of the coveted CFA Equity Research Challenge. 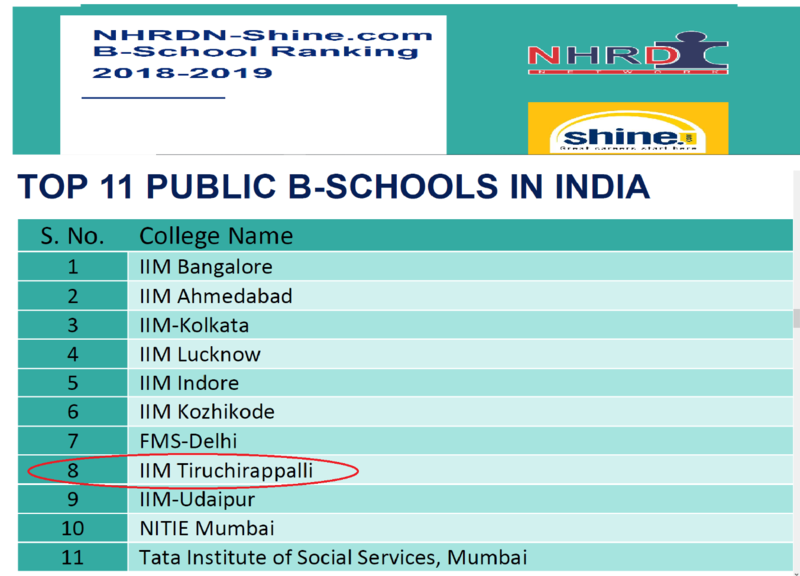 IIM Tiruchirapplli is ranked 9th among top B-schools in MBAUniverse.com Ranking 2018-19. Dr. Bhimaraya Metri, Director, IIM Trichy has been conferred the “Distinguished Services Award” by Indian Subcontinent Decision Sciences Institute during 12th ISDSI Annual Conference at SP Jain Institute of Management and Research (SPJIMR) Mumbai on 28th December 2018. Award was given by Shri Gopichand Katragadda, CTO, TATA Sons Mumbai. Apart from the Chief Guest, Shri Gopichand, Prof. Ranjan Banerjee (Dean, SPJIMR) and Prof Jeet Gupta (Former President DSI, USA, VP Asia Pacific DSI and President ISDSI) were also present during the award ceremony. 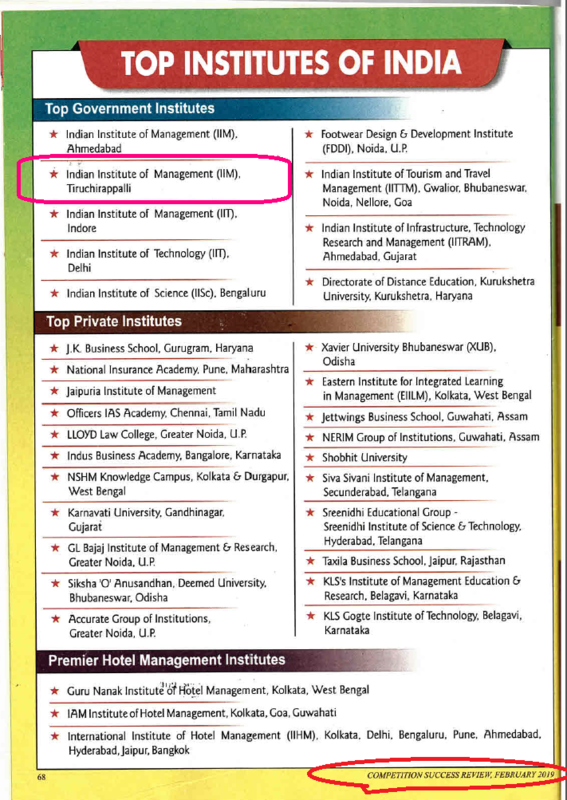 "Learn more about the campus, faculty and students at IIMT"